FULTON, NY -The Sunoco ethanol manufacturing facility in Fulton has received a $200,000 grant as part of Governor Andrew Cuomo’s $709.2 Million New York State Economic Development Resource Initiative. Former Lt. Gov. 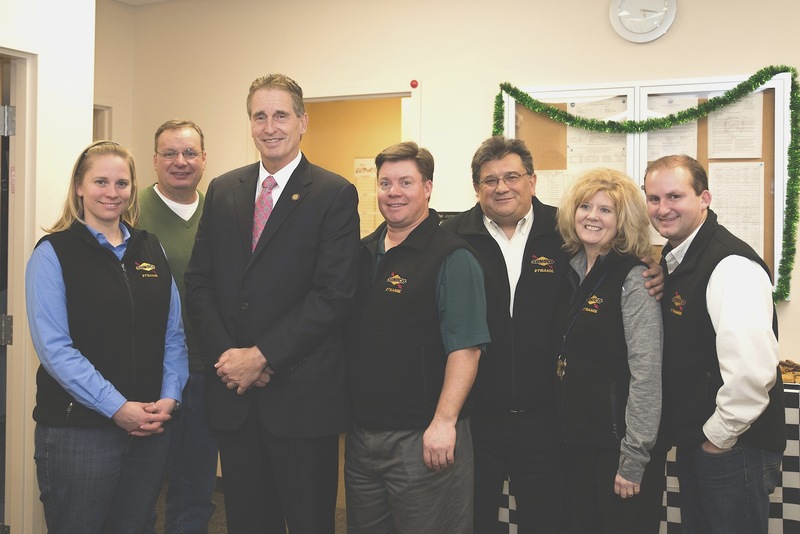 Robert Duffy visited the Sunoco Ethanol plant in December. He is pictured with management team members of the facility. From left are: Jennifer Jordan, Health, Environment and Safety Manager; Tim Hardy, General Manager; Robert Duffy; Nate Laun, Manager of Biofuels Technology; Alex Bogawitch, Maintenance Manager; Kathy Whaley, Human Resources Specialist; Guy Clemons, Production Manager. The grant, supported by State Senator Patty Ritchie of the 48th Senate District and State Assemblyman Will Barclay of Assembly District 120, will help support construction costs of an estimated $1 million weigh station consisting of two scales and a scale house at Owens Road and Route 57. The proposed scales will be constructed deeper into the plant, allowing trucks to be properly stacked while waiting to be weighed in. The current scale house is also not sufficient to meet employees’ needs. A new scale house will provide a more suitable space for employees to work. The new scale house will include a locker room and restrooms for employees to use, which they currently do not have easy access to. The project is expected to break ground in April of 2015 with construction to be completed by June 1. It is expected that a number of local and regional construction contractors will be on site to help bring the project to completion. The Fulton plant is the first ethanol processing facility owned and operated by Sunoco, and is located on 115 acres that was formerly home to a Miller Brewing plant from 1971-1994. The plant has the capacity to produce 85 million gallons of ethanol fuel per year. In fact, the ethanol produced by the Sunoco Fulton plant is used in Sunoco racing fuels, the official fuel of NASCAR. The Regional Economic Development Council initiative was established in 2011 to develop long-term strategic plans for economic growth throughout New York State. It consists of 10 councils made up of local experts and stakeholders from business, academia, local government, and non-governmental organizations. The REDC grants award supports projects in Genesee, Livingston, Monroe, Ontario, Orleans, Seneca, Wayne, Wyoming, and Yates counties. After three rounds of the REDC process, more than $2 Billion has been awarded to 2,200-plus job creation and community development projects consistent with each region’s plans. It is a centerpiece of the Cuomo’s strategy to create jobs and grow the economy.